Each time you make a reservation through this website, your reservation is made directly with Livanios Studios. As such, you are guaranteed the lowest possible rate, unlike reservations made through third party systems (whose prices include the given platform’s commission). 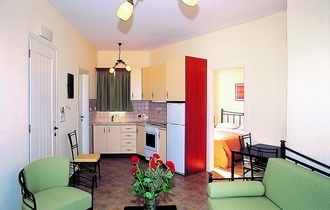 To send a reservation enquiry directly to Livanios Studios click here! 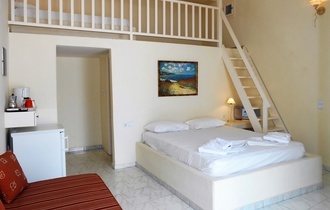 In an exceptionally friendly quiet and pleasant environment in Adamas Milos, we invite you to enjoy a memorable holiday and carefree summer moments, in the warm and cozy complex Livanios Studios. With attention to detail and the exceptional combination of island architecture and contemporary design, it is the perfect environment for couples and for families. The complex includes a sea view apartment 45 m² which can accommodate 2-3 persons, studios, 25 m² each one, which can accommodate 2 persons, and traditional rooms, 25 m² each one, that can accommodate 2-3 persons. To finalize a reservation, a down payment of 30% of the total value of the stay is required, with a minimum down payment of one overnight stay.